As the old stage adage goes… The Show Must Go On! Home » About » News » As the old stage adage goes… The Show Must Go On! Lincoln-Woodstock’s community theater group, The Playhouse Players, fresh off the success of this holiday season’s A Christmas Carol, will be performing the family-oriented comedy, You Can’t Take It With You, a favorite among community theater circles. A Christmas Carol, which was staged, costumed, lighted and performed by volunteers, was enjoyed by more than 1,250 people in the community, and this March the Playhouse Players are going to do it again! The process of staging You Can’t Take It With You has been a roller coaster ride of brilliant comedic moments, heartbreaking turnovers in casting due to family emergencies, touching generosity from supportive community members, and a combined drive from the core cast that this play will go on and audiences will laugh until their stomachs hurt! You Can’t Take It With You, a comedy written by Moss Hart and George S. Kaufman, is about a family in the 1930s who has thrown societal expectations to the winds and chosen to live as they please- together with an aquarium full of snakes and a cellar full of fireworks. Grandpa Martin prefers to spend his time at circuses and commencements rather than at work, while Mother Penny types away at six different (never-completed) plays full of scandalous intrigue. Then there is Mr. DePinna, a hanger-on who came to deliver ice to the house eight years ago and never left (locals will enjoy favorite Jay Polimeno of Polimeno Realty in the role!). One day, the youngest daughter Alice comes home to announce that a gentleman will be calling on her- her boss’ son, as a matter of fact. When Alice and Tony get engaged, nothing can spoil their bliss, expect perhaps the prospect of a meeting between Tony’s wealthy parents and Alice’s slightly insane family! Will the Sycamores pull off their ruse as a completely normal family, or will Mr. and Mrs. Kirby discover that their son is marrying into a family that plays Beethoven on a xylophone, learns ballet from an angry anti-Stalin Russian immigrant, and has never paid a day’s worth of income tax? 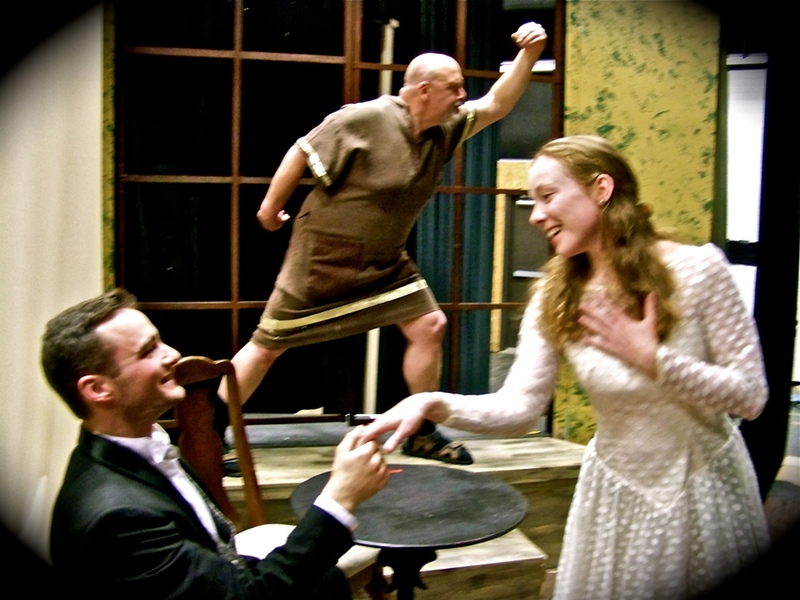 From Left: Tony (Brett Lucas), Mr. DePinna (Jay Polimeno), and Alice (Christa Hollingsworth). You Can’t Take It With You will play at Jean’s Playhouse in Lincoln March 8-10 and 15-17. (Friday and Saturday performances at 7:30p.m. and Sunday matinees at 2:00p.m.) Jean’s Playhouse is located at 10 Papermill Drive in Lincoln, right behind the Price Chopper in the middle of town. Tickets are $25 and may be purchased online by clicking here or at the Box Office; phone number (603) 745-2141. TICKET SPECIAL- Patrons may purchase Buy-One-Get-One-Free tickets online on Friday, March 1 ONLY. CLICK HERE, choose your preferred date and seats, and enter coupon code “BOGO” to receive the Buy-One-Get-One-Free discount! Support Lincoln-Woodstock’s community theater group and enjoy a wacky family-friendly night out!